Marketing is not an easy task. Those who succeed develop an idea so profoundly ingenious and/or addictive that you find yourself sucked into it without even knowing it hit you. If we take a moment to make a quick inventory as to what physically surrounds your computer alone, or what you’ve bookmarked in your computer, I guarantee you, you’ll be amazed as how marketing has shaped your life. When marketing plays into the world of wine, we can look towards both Lancers and Mateus for their pioneering spirit. Using the idea of “different is good”, they shaped their bottles to separate themselves from the pack. The squat, heavy bottles were easy to recognize and were versatile as common household objects such as vases or water jugs. Bonny Doone is another great example of a winery that’s become legendary for pushing the limits with their marketing techniques. Soliciting for label designs on their website, each Bonny Doone label is now designed by artists of all different backgrounds and styles from every corner of the world. Consequently, it not only personalizes each bottle of wine for the consumer to easily remember, but it also promotes the international art community. A fantastic idea. Finally, we can turn to Bodega Torres and their Sangre de Toro campaign to launch the bottle with a small, black bull hung playfully by a ribbon around each bottleneck. The campaign was an enormous success by creating brand awareness through a gimmick that was easily recognizable in the store, collected by people who found it kitschy and fun, and forming nicknames like “the bull wine” and “speed bull”. Speed bull was a name given by friends of ours who discovered that the bull’s horns could be turned backwards, making the bull appear as if he’s running the 500 yard dash. In March, Ryan and I had come across an article in Decanter titled, “Torres tempts Priorat buyers with Da Vinci mystery…“. The article described the launch of a new wine by Torres called, Salmos, with a marketing campaign designed to draw on the success of the book “The DaVinici Code“. What Torres had created was a game that could be followed through the Spanish countryside in search of a “hidden treasure”. It had the makings of a great marketing campaign. There was intrigue, mystery and obscurity. And initially, it worked! We were hooked. With the help of Spanish author, Javier Sierra, The Salmos Project was based on historical events from when the Carthusian monks cultivated the vines in the Priorat back in 1095. Unfortunately, as a result of religious upheaval in 1835 throughout the region, the monks abandoned the vineyards, leaving them to grow wild and unkept in the rocky steep terrain. It wasn’t until 1996 when Torres bought 150 hectares, replanting the vineyards with Garnacha, Syrah, Cabernet Sauvignon and Cariñena grapes, that Salmos was born. 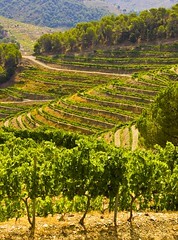 Contacting Torres’s marketing department, we were formally invited to experience the “Salmos” project in the Priorat. And despite the fact that we’re knee deep in Portuguese wine, we scheduled a visit for the 14th, in giddy anticipation as to how they would present the project to us. Would they have us follow the clues on our own? Would visit the monastery where the carthusian monks lived for centuries before being forced out of the region? Sadly, we received none of the above. Although we were given a breathtaking tour of the Porrera vineyard, where 60 of the 150 hectares in the Priorat are located, we were not formally presented with the project. And to be honest, we were disappointed. After watching the video sent to us, reading up on all the information we could find on the project, and finally, taking a one hour train ride with the expectation of discovering the “mystery”, it felt as if it was all for naught. Granted, we did have a fantastic time learning about the region, seeing the vineyard and tasting this absolutely incredible wine, I felt as if they invested a lot of time and effort in an idea that didn’t completely play itself out. I realize marketing is tricky. I also realize that Torres, unlike many wineries, is very forward thinking, continuing trying to push the envelope as to how they can incorporate their consumer base more efficiently and effectively. Even if the project wasn’t a complete success, their wine sales are far from suffering. Their 2005 vintage is completely sold out after producing 25,000 bottles, and they anticipate similar results next year when they release 40,000 bottles of 2006 Salmos. 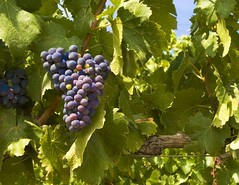 Next year will also be the first release of their Top Salmos, a single vineyard wine that said to be fantastic. In short, try this wine! It is absolutely silky, elegant and worthy of sipping upon all evening. Check out our tasting notes below for more information on the wine! Note: Gorgeous dark purple color to this wine, the definition of “inky”. Rich but tight nose, right after opening the bottle. It slowly opens and develops into almond, pepper, and a breadiness. With time it allows fresh raspberry, brambles, and cherry to come forward. Pure and silky in the mouth with good acidity and fine tannins.Cherry and anise are the first flavors out of the glass followed in time by pepper, cinnamon, clove and other dark fruits. Really need to drink this over the course of a night to fully understand it. Note: Dark blackish purple that looks almost like squid ink. With a little time, the bouquet relaxes, becoming pungent and rich with aromas of black pepper, black raspberry, exotic dark spices and violets. Silky mouthfeel with medium acidity and lush fine tannins. We only had a quick taste of the wine, so I fear the palate didn’t totally show its full capacity. I definitely picked up more of the black pepper and dark berries, but I’m confident it would evolve if given more time.